On the anniversary of the tsunami that killed 248 people, Kristian appears on a television show, with a pretty newscaster promising “powerful stories of courage and compassion.” The government expert (Stig R. Amdam as Johannes Løberg) is reassuring that there are no indicators of a recurrence. “We can’t live in fear,” he says. But Kristian knows that is not true, and he is not willing to reframe what happened as a feel-good story. The death of another scientist leads him to clues that a major earthquake may be about to strike Oslo. He goes to the scientist’s home, where the man’s daughter Marit (Kathrine Thorborg Johansen) is getting ready to throw all of his papers away. Like Kristian, the scientist has one of those rooms with charts and clippings all over the wall and a map on the floor, which anyone who’s ever seen a disaster movie knows this means that he was right, and the professionals staring at rows of computer screens, explaining that “our instruments have never been more precise” and dismissing “alternative theories” must be wrong. And when our hero decides it is time to shave that raggedy beard, we must be getting close to the good stuff. It takes nearly two-thirds of the film’s running time before the title disaster arrives, which gives us time to reconnect with Kristian’s estranged but sympathetic wife Indun (Ane Dahl Torp) and his college student son (Jonas Hoff Oftebro). It all sets up what is to come—a lot of high-end special effects, some impressive stunts, and of course family reconciliation. And this “Quake” delivers with skill. The build-up to the disaster nicely intensifies with a feeling of dread, and some of the subtlest early effects are the most powerful. “What I’m going to tell you is going to sound completely insane,” Kristian says to Indun. “I don’t want to scare you ...” And then the lights quietly just go off in the building, as they later will throughout the city just as Julia is performing in a dance recital. Knowing something is about to happen, Kristian leaves Marit in the car with Julia as he goes to find Indun, who is at her office on the 34th floor of a skyscraper. Julia runs out of the car, and Marit goes after her. So all four of them end up in the building as the quake hits, Kristian and Indun in an elevator and Marit and Julia in an office that is suddenly near-perpendicular. The sound design in this film is exceptional, as important as the striking visuals in conveying the sense of collapse. Director John Andreas Andersen understands that the ping of a snapped cable or the crackle of a windowpane starting to split can be as terrifying as a deafening blast. Andersen also displays a strong grasp of visual storytelling with various striking images: the dot of brightness from a flashlight in a tunnel, the red tones of an elevator shaft, a grand piano (in an office for some reason) sliding down the suddenly-sharply angled floor. There are fewer special effects shots than we’d see in a Hollywood version, but they are shrewdly deployed and suitably unsettling. 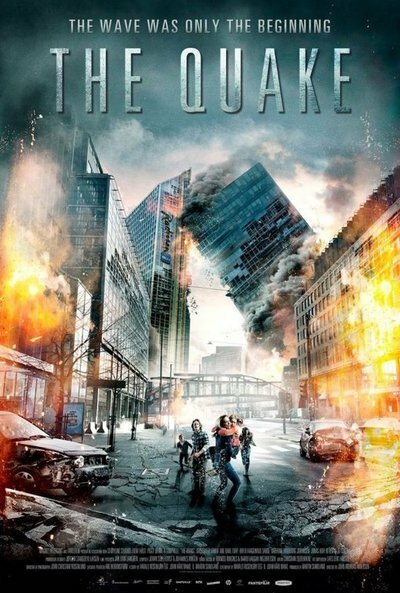 Like too many other disaster movies, this one suggests that the primary purpose of catastrophe is family reconciliation with a side order of “I told you so.” An enormous, literally earth-shaking catastrophe comes down to whether a father can overcome PTSD to save his little girl. That makes it difficult to enjoy the film as pure special-effects entertainment or appreciate it as a cautionary tale. That pretty newscaster was right—we want stories of chaos and carnage framed with “courage and compassion.” If that does not extend beyond the hero’s own family, however, even the most skillful effects are just pictures.